Steve is the first gay character to date on the Mass Effect universe. Steve was married to Robert, who is now deceased. The character development goes from Steve still suffering his loss, with either Female or Male Shepard helping him ho through this process, to a Steve that enjoys living again. In this point, he opens the possibility to love again and can engage in a love relationship with Male Shepard. 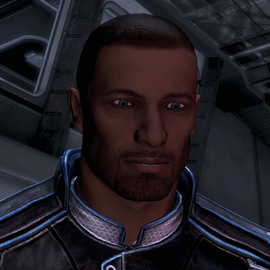 Steve is also very good friend with James Vega, a heterosexual character that can either develop a relationship with Female Shepard or with Ashley (one of the three NPC romances that we can see on the game, the other being Garrus Vakarian with Tali Zorah vas Normandy and the Normandy pilot Joker with artificial intelligence-turned-real EDI). This entry was posted in 2010s, Gay, Gay (explicit), Queer Men on October 30, 2015 by Adrienne Shaw.